What Is the Role of the Embassy in the Adoption Process? I can still remember walking around a misty cobblestone street while looking for cars in Warsaw, so I could cross with my three new children to the embassy, and trying not to let them see my anxiety. After we checked our valuables through security, we tripped downstairs to a basement that reminded me of a small-scale DMV, with a few rows of cube-shaped chairs and rectangle screens displaying the numbers of visitors allowed to visit the windows after they had waited their turn. A pup tent and a small plastic kitchen, for children’s entertainment, were placed in the corner, although it didn’t seem to entertain my kids for very long. Tiny waves of comfort and longing rippled through me as I eyed the framed posters on the walls, exhibiting photos of bouldered waterfalls in Pennsylvania and the cobalt sky illuminating the Empire State Building. I imagined what it would be like to dream of visiting those places for the first time, how cosmopolitan and enchanting it all must seem before your sneakers hit the crowded streets that smelled like cashews and exhaust fumes. But I yearned to bring my family home, where life would no longer feel like sitting in a waiting room. I had never visited an embassy before adopting internationally, and many Americans never have. If you are planning on going overseas to adopt, the embassy in your child’s birth country, as well as those at home, play a valuable role in the process. If you are adopting from another country, your child will need a visa before traveling to the United States. The paperwork begins before your trip, and your adoption agency or lawyer can guide you through filling them with USCIS. Then, the case is forwarded to the US Embassy or consulate in their own country. The child or children must have an interview at the embassy before they come to live in the United States. In our case, our whole family had to visit the embassy during our appeal period, when we had to remain in Poland 21 days after our adoption court date. Once we received our children’s visas, we were permitted to bring them on the plane back to New York. After the adoption is complete, you may have to remain in-country to finalize some paperwork. In many cases, you may relocate to the city where the embassy is located to expedite the process before you can travel home. If you are adopting internationally, you may find yourself having a lot more contact with the Bureau of Consular Affairs at the US Department of State, and particularly with the Office of Children’s Issues. The office serves as the central authority for the Hague Convention on Protection of Children and Co-operation in Respect of Intercountry Adoption. Most US families adopt from Hague countries. 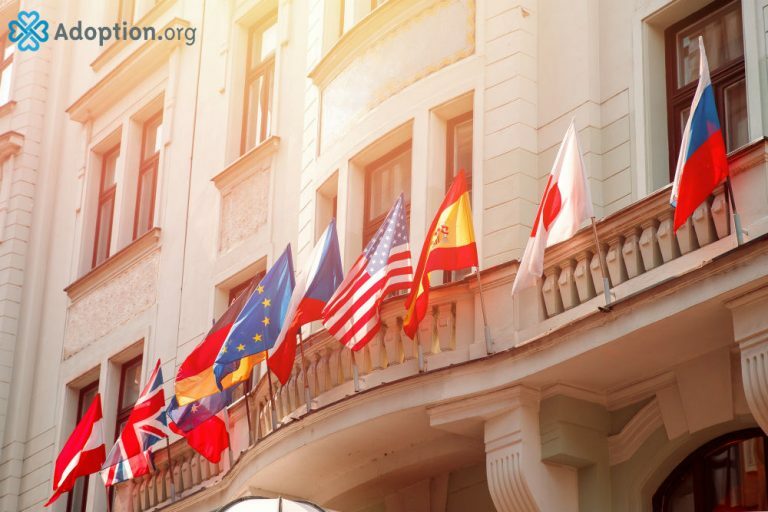 The Hague Convention created a series of safeguards designed to protect the best interests of children, birth parents, and adoptive parents involved in an international adoption process. The Office of Children’s Issues provides information about the adoption process to prospective adoptive parents and adoptive service providers, produces country-specific information, and monitors complaints against agencies. It is important to remember that the embassies are your allies during the adoption process, by helping to keep the procedures safe and legal. As with all of the visits related to adoption, you will hardly remember them when it is over, thinking only of your new family and the blessing it is to be a parent.